Prato is about twelve miles north of Florence and it’s a bit like going to the moon in preference to visiting the earth. But there is so much to recommend it, not least having the place to yourself, especially in October. 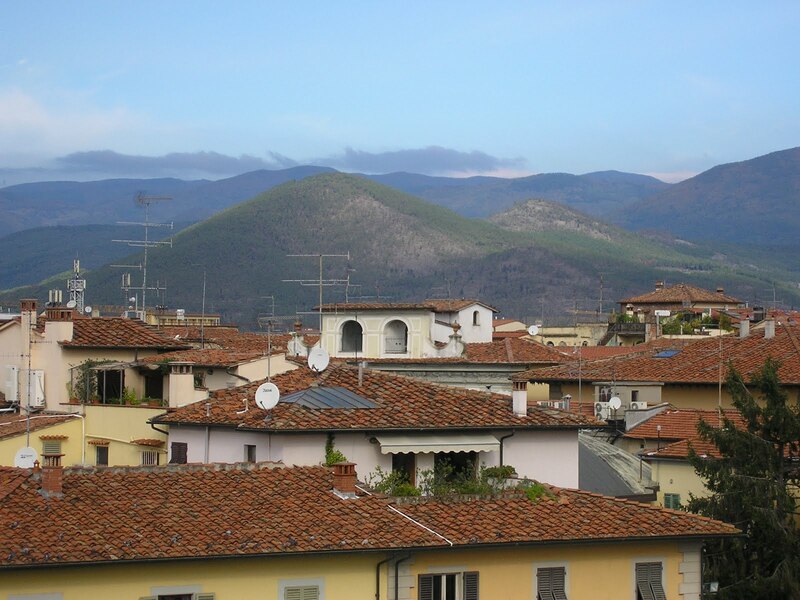 We did mean to visit Florence – I had it down twice on my itinerary – but the charms of Prato and the peaceful life got to us. We stayed in BB.Magico, which is just off the cathedral square. Being so central meant that no monument or museum was more than a ten minute walk away, which is about all I could manage with a fallen arch. It was a working trip – researching the life of Filippo Lippi – but we needed a holiday as well. I’d seen all the Lippi’s by the end of the second day (or was it the first?) so after that I could just concentrate on being there. The Calvana hills are a backdrop to the city and one day we sat outside a bar looking at them in a severe rain storm. Only the English. . .
As the week progressed, we got deeper into the project. We’d asked where Lippi had lived but no one could tell us. Then, on Sunday evening and out on a fruitless walk to find somewhere open where we could buy something to eat, David crossed the street to read a marble plaque. ‘Here lived Filippo Lippi’. I’d spent the week thus far making up the location, given the paucity of information – I’d got it wrong by about twenty paces. Then we told the lovely Cristina, who lives on the first floor of the house we were staying in, what we were looking for, and she thought she knew someone who could help. Enter Simona, on our last day – a whirlwind of facts and information. I haven’t mentioned it before on this blog, but perhaps now is the time to come out. I anguished for a long time, once the trilogy was complete, as to what my next novel would be. A nudge from a friend sent me hurtling into the 1450s. It’s a prequel, and the trilogy is set to become a quartet. Amongst other things, it deals with Botticelli’s youth. I hope to be finished next year, in time for his 500th anniversary.